Born in Atlanta, Georgia, Storm Reid made her big screen debut in the role of Emily at age nine in the Oscar-winning drama 12 Years a Slave (2013). A number of guest appearances on popular TV series followed, including Nicky, Ricky, Dicky & Dawn and NCIS: Los Angeles in 2014 and Chicago P.D. in 2015. In 2016 Storm shot to fame when she was cast in the starring role of Meg Murry in Disney's A Wrinkle in Time (2017). Since then, she's completed production on Judy Greer's directorial debut, A Happening of Monumental Proportions (2017), co-starring Allison Janney, Common and Bradley Whitford. She's currently filming the Blumhouse Production Only You, alongside David Oyelowo. 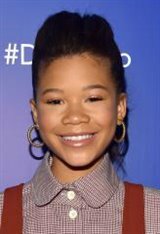 Bio photo of Storm Reid courtesy of Walt Disney Studios.